El Shaarawy joins Roma on permanent deal. 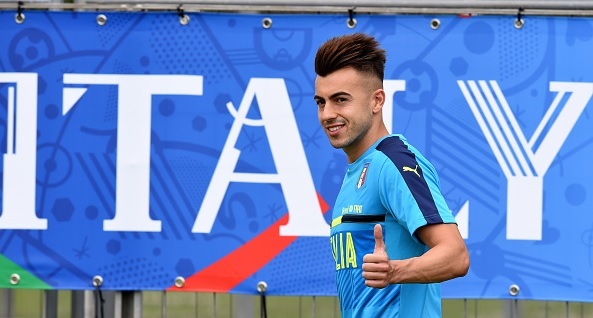 Former AC Milan striker Stephan El Shaarawy has completed his permanent move to AS Roma, according to SkySports. Former AC Milan striker Stephan El Shaarawy has completed his permanent move to AS Roma, according to SkySports. The Italian was on a loan deal at Roma from AC Milan, the deal included an option to buy him this summer for £10million. The 23-year-old who is currently at the international duty with Italy squad at the Euro 2016 has been eyed by several top sides including Premier League trio Everton, Liverpool and Arsenal. However, he has now ended the links as he penned a four year deal at the Serie A side. El Shaarawy spent first half of last season at French side Monaco but after his impressive game at Roma in the second half, he decided to stay at the club. El Shaarawy scored eight goals in 16 games for Roma. Manuel El Shaarawy who is his agent and brother declined Sky Italia last month about his brother potential move to English side. The Italian joined the club from Genoa for £7.5million, where h scored 22 goals in 55 Serie A starts but later struggled under former boss Filippo Inzaghi at the Italian giants. Despite of big links the forward wanted to stay in his country. He is still 23 and has potential to regain his form.